Lobster is one of my favourite foods. All by it’s lonesome, it’s irresistible. So the most important thing you can do when preparing lobster is to avoid making it less than the perfect it is when nothing is done to it. This salad does the trick. It is simple, fresh and low cal. It will impress the heck out of your eating partners. 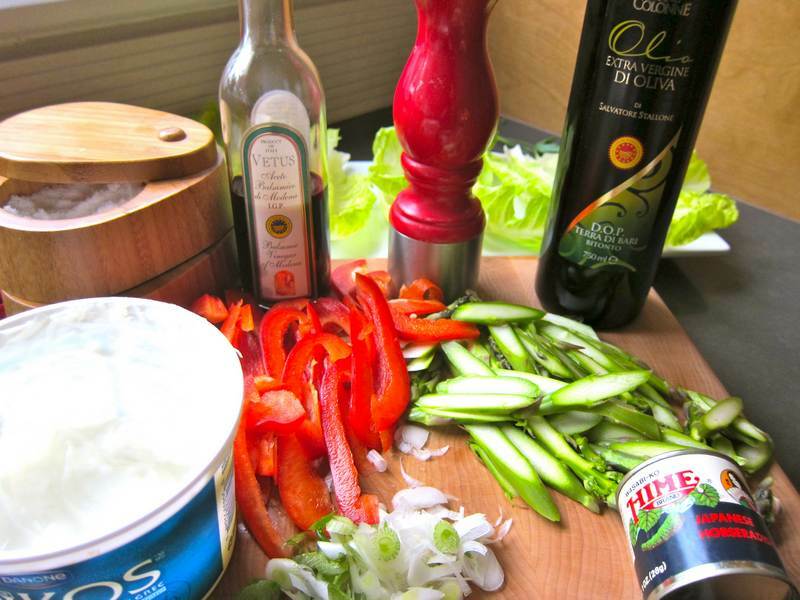 Mix dressing ingredients in a medium-sized bowl, then add asparagus, pepper and scallions. Marinate for 15 minutes at room temperature. Divide the marinated vegetables into 4 lettuce leaves. 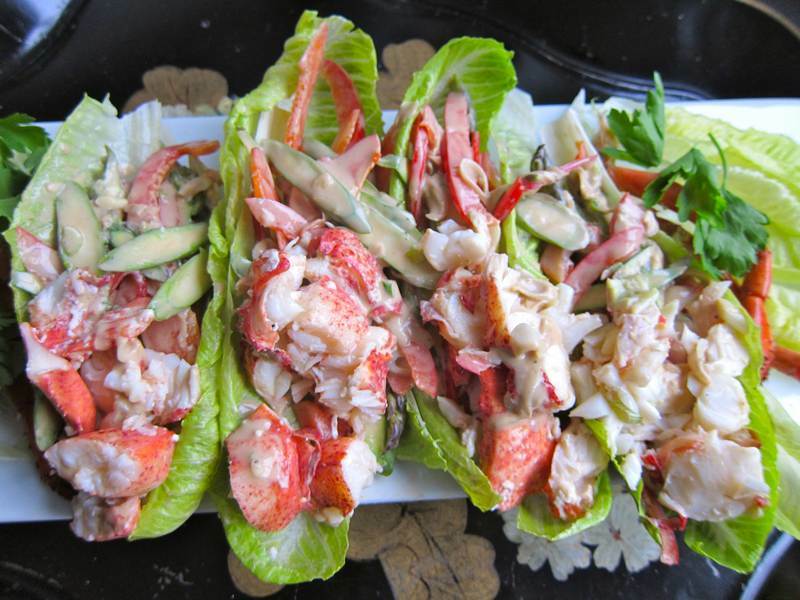 Place the lobster on the tip of each lettuce leaf so that the marinated vegetables show and, garnish the platter with extra lettuce, parsley sprigs and a few lobster legs. Serves 4. You simply must get to the MMFA to see the breathtakingly beautiful Chihuly exhibit. Catch a tour to get all the stories behind the art work. On July 19 you can see the exhibit at a Maimonides fundraiser. I just learned that asparagus can be eaten raw if thinly sliced. 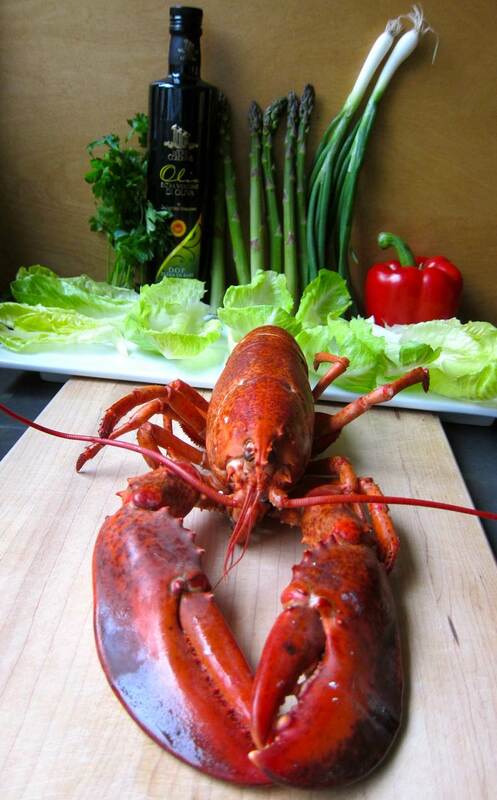 Watch the video below to see how to shell a lobster – the Canadian way. Love lobster. Just never cooked one. I get them steamed from my fish guy. Great idea, beautiful presentation. Yum. This one was purchased already cooked at my local Metro all purpose grocery store.. It’s lobster season! Yay!! gorgeous presentation Holly. Nothing beats the taste of fresh lobster! Thanks! And I agree. Lucky Maritimers! Looks like you have a great salad. Not too much dressing that covers upthe taste of lobster. That was a beauty of a lobster also. Thanks Jovina! I agree that a light dressing keeps it tasty. Less is more! This sounds delicious. 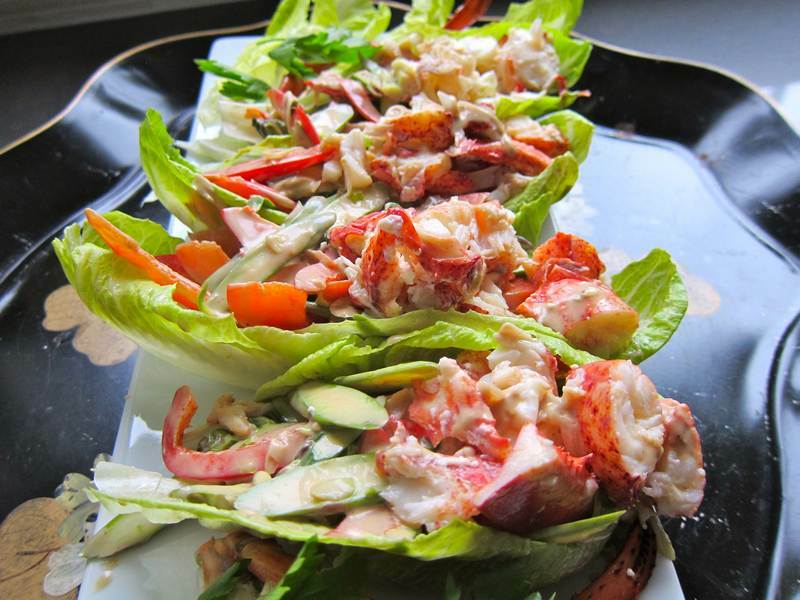 I loved to eat lobster salad when I lived back East. Thanks! I think we have a consensus here.